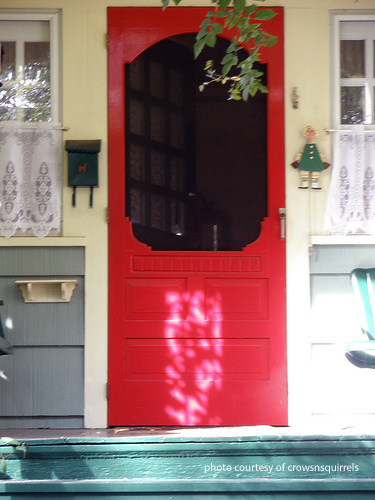 Mary and I are wooden screen door lovers (see our special screen door story below). We love fresh air and have our doors and windows open as often as weather permits. 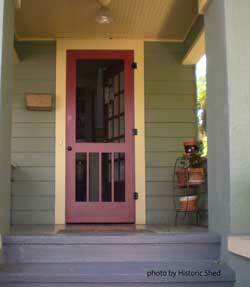 I grew up with a wooden screen door and fondly remember the sound of it slamming shut as I ran outside. 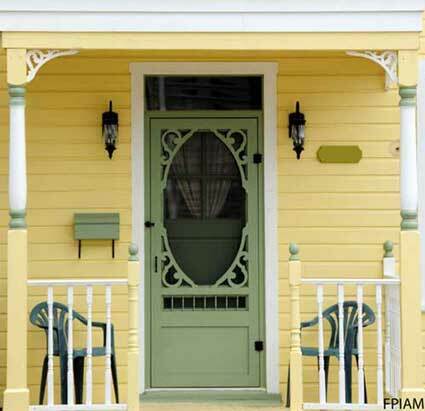 The quintessential wood screen door is like nothing else on your porch. It radiates warmth and appeal, helps cool the house, and if you have glass inserts, can serve as a storm door in winter. 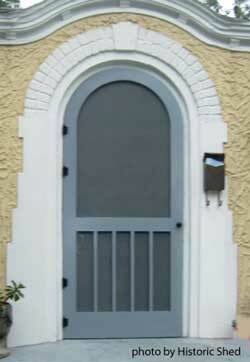 We are very pleased to be able to feature Vintage Woodworks screen doors. These custom hand made doors are made from high quality woods and come with optional windows to easily turn them into storm doors. Yet another option is to use them as interior glass doors for their unique beauty. Vintage Woodworks is one of our fine sponsors and we are proud to tell you about their handcrafted wooden screen doors. No matter your situation, there's a screen door or screen option that will fit your needs no matter if you have a log cabin, contemporary home, or live in an apartment or condo. We know you will be pleasantly pleased with all of your options. 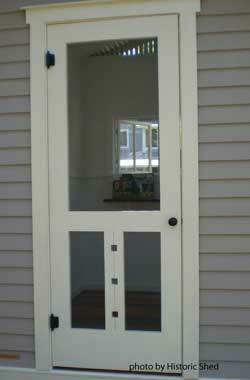 The two most important features of a wood screen door are its quality of construction and appeal. Vintage Woodworks fortunately has both. It is important to select just the right design to complement your home for maximum curb appeal. From the simple to the ornate, here are but a few design options from which to see. Find a design you like? Great! If not, you can design your own screen door. 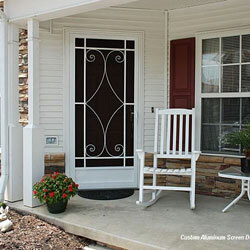 Vintage Woodworks allows you to easily create a screen door design that is just right for your home. Check out Vintage Woodworks. They can make your door a reality. When purchasing wooden screen doors demand the highest quality. Woodworkers know that wood "moves". Specifically, it expands and contracts based on its moisture content. This makes wood doors susceptible to warping over time. Vintage Woodworks frames are solid 1-1/8" thick and kiln-dried. One-inch front and rear decorative mouldings add 1" for a total thickness of 2-1/8". They also leave sufficient space for hardware. Frames are constructed using mortise and tenon joints. Joints are fixed with wooden pins to ensure the frame does not separate. Screen panels must fit snugly. Vintage screens area attached with brass screws. Back mouldings hide the metal frames. Not all screen doors can accept glass panels. This option easily allows you to convert your screen door to a storm door by using tempered safety glass. 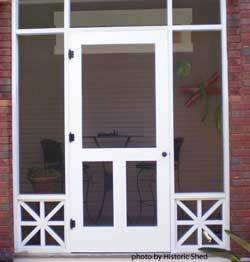 It is important to note when purchasing screen doors that replacement and/or repair parts should be convenient. 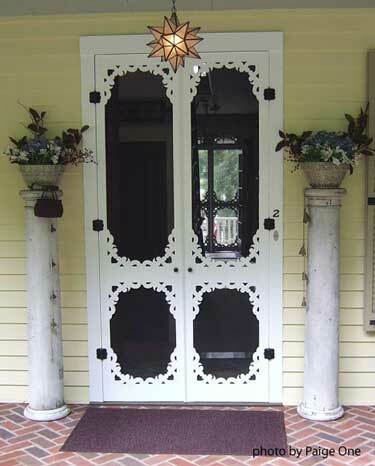 Vintage Woodworks' screen doors are made with standard size components making it easy to find the parts you might need. Wood screen doors hold wonderful memories for most of us and we'd love to feature yours. It's easy. Take a picture and attach it to our contact us form. 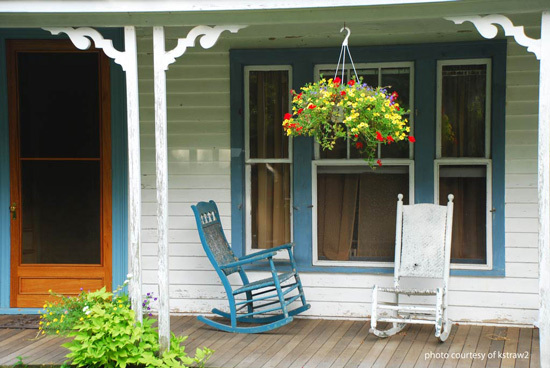 And if you want, share a porch memory with us too. You can attach it here! The following eight wood screen door pictures courtesy of Historic Shed, makers of fine custom designed vintage screen doors. 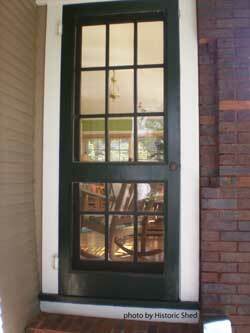 You'd think a vintage screen door is just a screen door; well, you might be surprised at the many options you have. 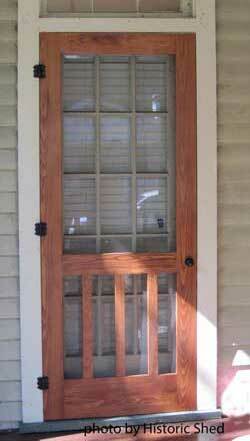 A wooden screen door, if made correctly, resists warping or twisting and can be painted or stained. Most have removable screens for ease of painting or staining and for inserting storm windows for winter use. Pre-finished wood frames are available for fast and simple installation. Wood frames can be cut down for custom applications unlike vinyl or aluminum doors. Treated woods area also available where durable construction is required and they resist termites and fungal decay. 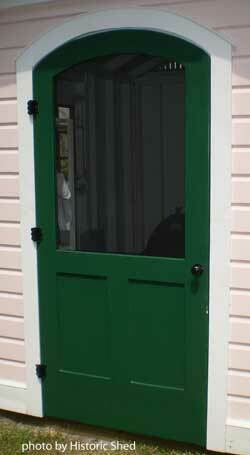 Custom made wooden screen doors are designed and built to last. Create your own design and choose your wood to make the perfect screen door for you home. Selections range from woods like Honduras' mahogany, oaks, African mahogany, cherry, Douglas fir, Spanish cedar, maple, ash, eastern white pine and poplar. If you are planning to paint your wooden screen door, I recommend using poplar; the grain is the easiest of woods to mask with paint. Were You Looking for a Screen Door Guard? We had these on our screen doors growing up. Did you? 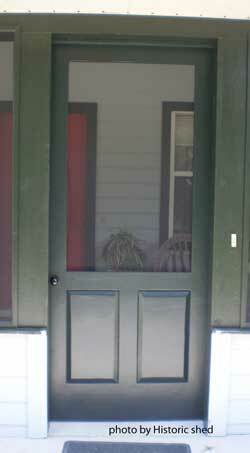 A screen door guard protects the screen from getting pushed out. If you have children in your home, a guard can save the screen from becoming loose over time and plenty of our readers purchase them. Many years ago we lived in Alaska and subsequently moved to New Hampshire. Sparing you the details, I took a house-hunting trip prior to the move; Mary and the boys stayed in Alaska. I quickly learned upon arrival that it was a super seller's market; housing prices were being bid up on the spot. I ended up having to choose between two houses. One had the family buried in the back yard (yes, they were buried in the back yard). Those from New England can relate I'm sure. The other was a very small house and a real fixer-upper. To get to the basement you had to exit through a screen door in the kitchen to the garage and then proceed down the basement steps. Needless to say, I didn't think Mary would like bodies in the back yard (although it would have made for an interesting Halloween). So I chose the fixer-upper and returned to Alaska. Mary then traveled to New Hampshire to close on the house several weeks later. She arrived just in time to make the closing at the office on a very dark and stormy day. She never saw the house before she closed. After the closing and with keys in hand Mary proceeded to go see our new home. The electricity was off so it was very hard to see the interior. While stumbling through the house, she noted the many things that needed to be done. She called me later that day to fill me in on the details. When I asked her: "How did you like our new home? ", Mary hesitantly replied: "Well, I liked the wooden screen door." Lesson learned: If you have to buy a house without your spouse make sure it has a great wood screen door!